Average Height	: 8" - 11"
Average Weight	: 3 - 7 lbs. Toy Fox Terrier Rescue, Inc. The Toy Fox Terrier was originally bred and developed in the United States in the early 1900's. The major bloodlines used to start the breed were from the Smooth Fox Terrier crossed with several other toy breeds and small types of dogs. Selection of the smallest of the Smooth Fox Terriers for early breeding meant that only a small amount of cross breeding was required to develop the Toy Fox Terrier breed. The goal of the early breeders was to miniaturize the Smooth Fox Terrier and reduce some the independence of the terrier natural to a more elegant and "family friendly" type companion dog. Early crosses to develop the Toy Fox Terrier including Miniature Pinschers, Italian Greyhounds and even the Chihuahua. The breed is now a true breed, meaning that only registered Toy Fox Terriers are used in breeding lines. The Toy Fox Terrier is also known as the American Toy Terrier or Amer-Toy. The Toy Fox Terrier was developed in the USA in the 1930's. It is directly descended from the Smooth Fox Terrier, which was crossed with various toy breeds such as the Miniature Pinscher, Italian Greyhound, Chihuahua and Manchester Terrier, with the intent of miniaturizing it. Its first use was hunting rats. The Toy Fox Terrier is a very alert looking Terrier Breed, bright and energetic while also very athletic and fairly muscular in appearance. People that are not aware of the breed often mistake these dogs for Jack Russell Terriers, although there are very definite differences between the two breeds. Generally the Toy Fox Terrier is much smaller, finer boned, shorter coated and much more refined looking than the Jack Russell. The Toy Fox Terrier has a true terrier personality and temperament. They are happy, lively and energetic dogs that are always interested in what the family is doing. The Toy Fox Terrier loves to be in the center of the action but they are also more affectionate than many of the terriers and enjoy just sitting with their owners. The Toy Fox Terrier will be very puppyish in his or her behavior, even well into the dog's senior years. They are highly intelligent and quickly learn an amazing number of words, commands and signals. They can be very curious dogs and will often find something to play with or entertain themselves if left alone for longer periods of time. When provided with toys and time to exercise the Toy Fox Terrier can tolerate being left at home during the day, providing they have lots of attention and interaction with the family in the evenings. As a breed, the Toy Fox has all the "big dog in a small body" attitude that is a hallmark of the terrier group of dogs. Unlike some of the terriers the Toy Fox will adjust very well to other dogs when properly socialized. If they are not socialized they can be dog aggressive, particularly the intact males. They are also not as independent as other terriers, however they do have a mind of their own and can be stubborn and strong willed at times. The Toy Fox Terrier does best with older children and considerate younger children. As with any toy dog younger kids don't seem to realize how small the dog really is, which can pose a risk to the dog. The Toy Fox Terrier loves to run and play and is extremely active all through his or her life. Not a problem barker, the Toy Fox Terrier is still a good watchdog and will bark very loudly to let you know when strangers approach. They may be prone to digging and chasing and are not good companions in homes with other small rodent type pets. When socialized with cats from a young age the Toy Fox Terrier does well with the family cats, but is likely to chase other cats that wander onto the property. Unlike many of the toy breeds, the Toy Fox Terrier is very healthy and will generally live to be between 12 and 15 years of age. The most commonly noted Health Problems in Toy Fox Terriers are skin Allergies and allergies to certain food additives such as beet pulp, corn and wheat. Carefully monitoring the dog's Diet can eliminate almost all of the allergy conditions. The short, sleek and thick hair of the Toy Fox Terrier is very easy to groom and maintain. Once or twice a week grooming with a medium to stiff bristle brush or a slicker brush is all that is required. A grooming comb or grooming glove is also an option for this breed and will help in removing any dead hair, debris or areas of tangles. The Toy Fox Terrier is a light shedder year round. When grooming be sure to check the ears and eyes for any sign of discharge and remove any foreign material using a clean, soft, damp towel. In addition check the nails and trim as needed to keep them just touching the floor when the dog is standing with weight on the feet. Always be careful when trimming the nails to avoid cutting into the quick, the central area of the nail that is full of blood vessels and nerves, much like the cuticle on a human nail. Bathing only as often as necessary is important to keep the coat in top condition. If the dog has skin allergies, use a fragrance free, hypoallergenic dog shampoo and conditioner to prevent causing any irritation to the skin. 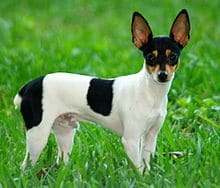 The Toy Fox Terrier requires regular exercise but they do well with self-exercising in a home or in a small secure yard. Since they are terriers and do chase, they need to be exercised either on a lead or in a fenced yard. As with any type of dog regular walks, ideally two or three times a day, will help keep these small, active dogs in top condition. Since they are active and a relatively high energy breed it is important to provide structured exercise times during the day. Without proper exercise they can become destructive resorting to chewing, digging and excessive barking. The Toy Fox Terrier is an energetic dog that loves to play. They are good at fetching as well as enjoying a romp or a run with their owner. The breed is good as a companion jogging dog and they have an amazing amount of stamina for their small size. It is important to monitor these dogs when playing with children to ensure the play doesn't become too rough. The Toy Fox Terrier that is kept with other companion dogs will quickly learn how to engage the other dogs in play. Training the Toy Fox Terrier requires both consistency and an understanding of the terrier temperament. The Toy Fox Terrier will quickly learn new tricks and commands, however like all terriers his or her intelligence means that they will also learn how to avoid doing things they don't like. Using a positive training reward system with the Toy Fox Terrier is essential, as they will disengage from training if they are punished or trained using negative methods. The Toy Fox Terrier is very alert and aware of their surroundings and training needs to be completed in a distraction free environment as much as possible. Training needs to start when the Toy Fox Terrier is just a puppy as this is the ideal time to bond with the dog. Keep training sessions short and avoid a lot of repetition that will simply cause the dog or puppy to become bored. Puppy obedience classes as well as lots of structured socialization are highly recommended as the Toy Fox Terrier is maturing and throughout their life. These dogs make excellent obedience and agility dogs as well as assistance dogs for individuals with disabilities. There is also a growing use of the Toy Fox Terrier as therapy dogs. Their small size, intelligence and athletic ability make them ideal as helping dogs and companions for those that need assistance.